Wow, that's a big tank! 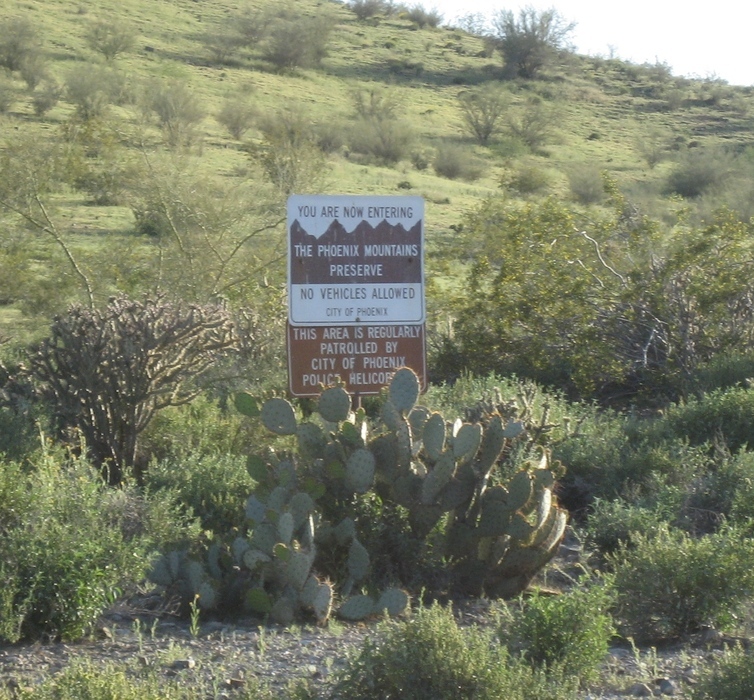 Shadow Mountain and its related prominences are a component of the Phoenix Mountains Preserve in the Lookout Mountain area. 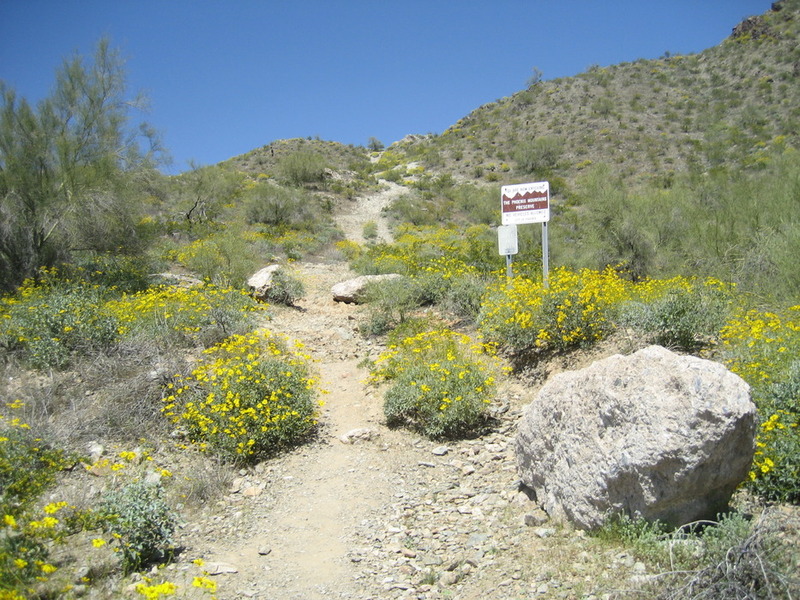 Although there are quite a number of natural and semi-blazed trails in the Shadow Mountain complex, there are only two, numbered trails. 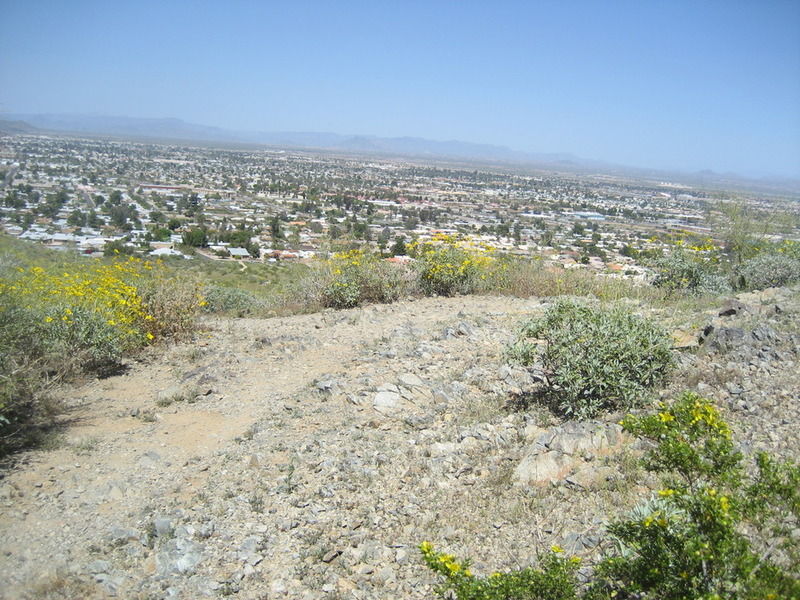 "Shadow Mountain, 1779' Prominence (via Big Loop)" is one of the many established, but unofficial trails. This trail is a short, refreshing hike for beginners. 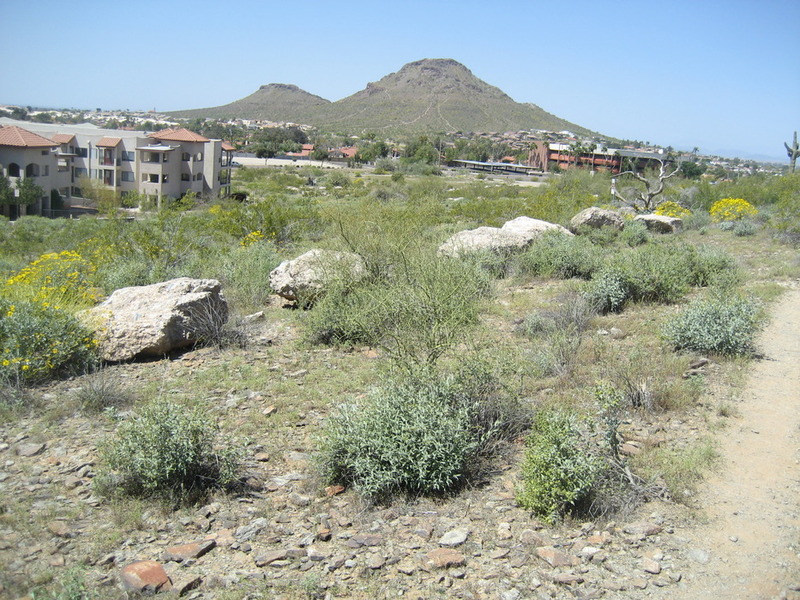 Visible from and just east of Cave Creek Road between Acoma Drive and Sweetwater Avenue, the activity area is easy to get to and offers a number of nearby post-hike refreshment options north on Cave Creek along the way to AZ101 (particularly on the southern side of AZ101 at the Cave Creek exit). 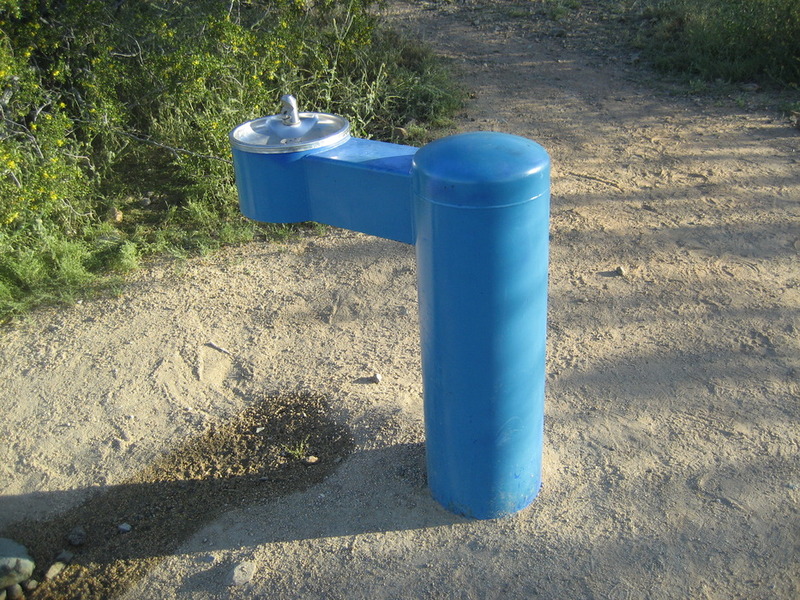 This is part of the preserve seems to be only partially developed (it sports only a few posts here and there and all of those posts lack trail trail identification badges), but it does have one drinking fountain, a watering trough, and a trash receptacle (at the trailhead). There are no restrooms. Based on the presence of spoor, the flat portions of this trail seems to be used from time to time by horseback riders. This seems to be a partially developed and only lightly maintained trail. 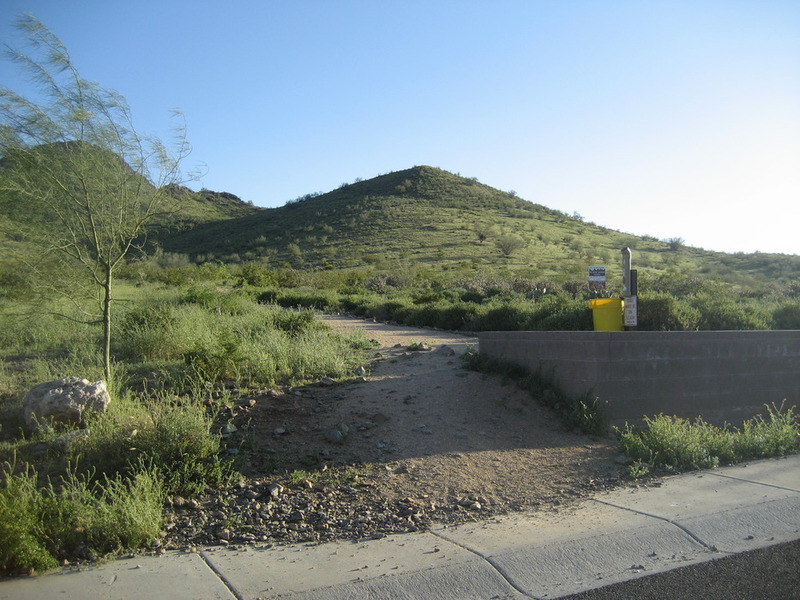 Because the Shadow Mountain trails are only partially developed, the trailhead, located at 33.618676, -112.026561 and identified as the "Acoma Drive Trailhead," is modest. 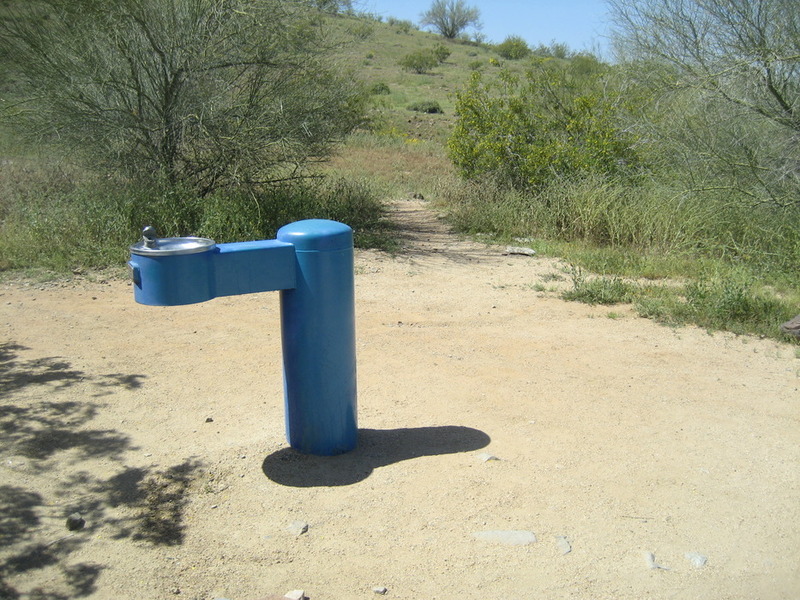 From the trailhead, proceed forward onto the "Big Loop" about 461 feet to the drinking fountain and then make a right turn so that you continue on a course perpendicular to the mountain rather than towards it (the picture shows the path away from the drinking fountain). After about 1,369 feet along the path, you will come upon a "crossroads." Turn left and walk roughly towards the rock outcropping. Follow the path (which actually passes to the left of the rock outcropping). 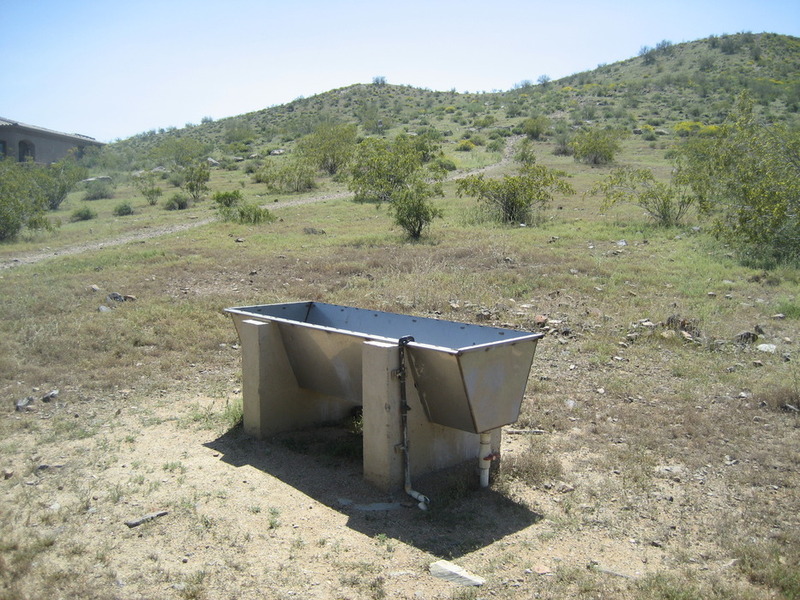 After about 1,140 feet or so, on the left will be the water tank (this is a rough distance and location: of course, you have to be sufficiently around the prominence on your left to see the water tank). Continue forward about 510 feet across the road and then another 630 feet, about until you see the assisted living facility and the big border rocks on the right. 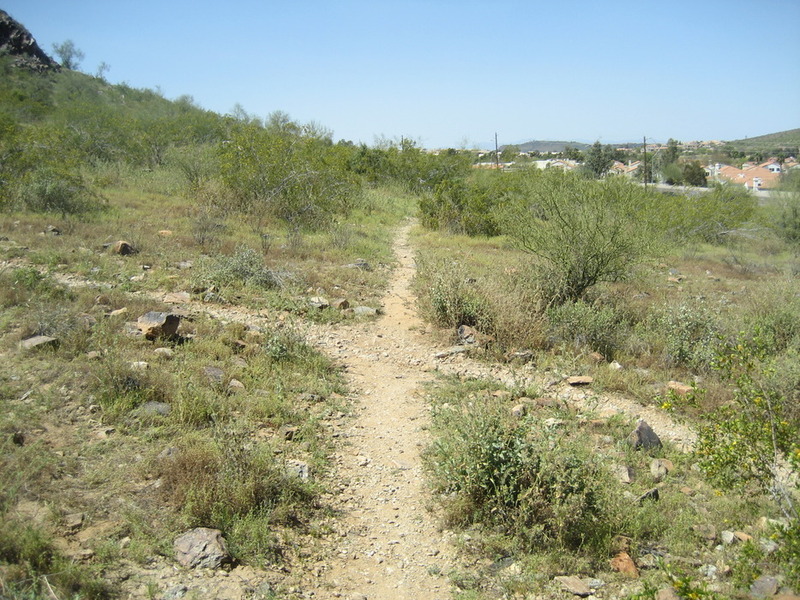 Continue on the path about another 825 feet (with the church to your right, now) until you come to a point where there is an unofficial insertion point onto the trail from the church parking lot on your right and a Phoenix Mountains Preserve sign on your left (with the trail continuing beyond the sign and up a slope). Scramble up the slope about 615 feet until you achieve the top of the ridge. Look forward and down and you'll see what the water tank looks like from above and you'll see the 1779' prominence across and on the other side of the water tank. Push on about 615 feet and then take a quick (roughly 30 foot) detour up a face to arrive at, arguably, the highest point on the trail. Quit your perch at the highest point and proceed about 720 feet to an intersection of trails. 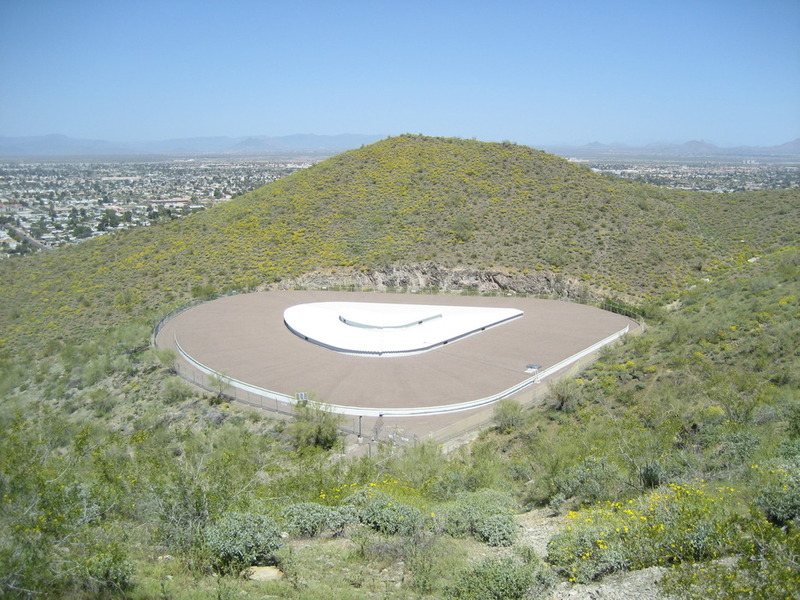 Turn to the left (leaving the "Big Loop") and walk 540 feet to the top of the 1779' prominence. From this point, you have a view of the water tank from a different, closer perspective. All told, this trail is about 1.41 miles in length, one way. To return to the trailhead, either backtrack the above route or return to and complete the "Big Loop." 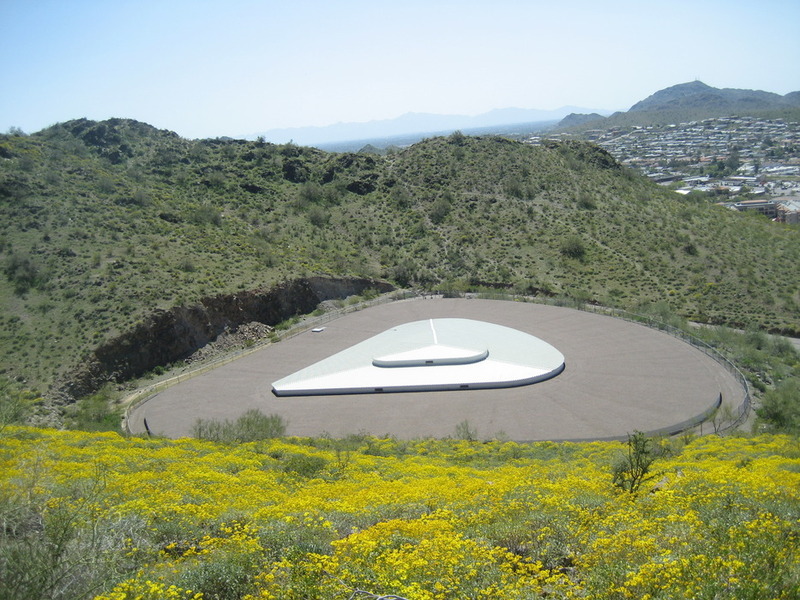 Take AZ101 (Pima Freeway, East Loop) to the Cave Creek Road exit. 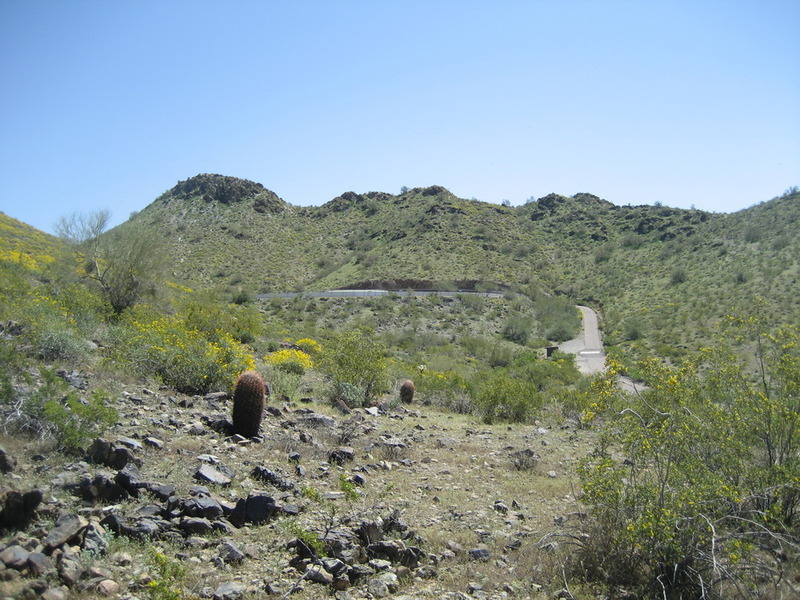 Drive south on Cave Creek 0.9 mile to Claire Drive. Turn left (heading east) and follow the road (as it veers right) one-quarter mile to 25th Place. Make right (heading south) and then a left to follow the road as it transforms into Acoma Drive. Park next to the trailhead.